Purpose of this call: To support active researchers in the generation and systematic collection of evidence of the impacts from engaged research, demonstrating effects, changes and/or mutual benefits to those participating. The Open University is committed to embedding public engagement within the culture of its research and the practices of researchers at all levels. 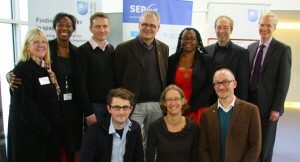 Over three years (2012-2015), principally through the work of the RCUK-funded Public Engagement with Research Catalyst, ‘An open research university’ and the School-University Partnership Initiative, ‘Engaging Opportunities’, the university will develop and implement strategies that promote structured and equitable mechanisms for effective and sustainable engagement with a range of publics, stakeholders and user communities. One of the key areas for development in relation to this wider project of culture change is the need to produce rigorous, systematic accounts of the impact of engaged research. This call contributes to this agenda. Contributing to this call will enable richer conversations about the impacts of engaged research, involving a diverse range of publics, user communities and stakeholders. It will help to raise the profile of engaged approaches to OU research, generating critical mass in this strategically important area, providing a route for sharing knowledge and expertise in how we plan, enact and evaluate engaged research. Excellent public engagement with research is reflected in the different ways that researchers meaningfully connect and share research with various stakeholders, user communities and members of the public. Done well, public engagement with research will generate benefits, changes and effects for all participants as they share knowledge, expertise and skills. Excellence will be demonstrated partly through recognition of the contributions that all participants make to the shaping of research agendas, the processes of conducting research, and in the products of that research. The generation and systematic collection of evidence of the impacts from engaged research, demonstrating effects, changes and/or mutual benefits to those participating. Initiatives that contribute to positive change with respect to practices, policies or procedures for generating and systematically collecting evidence of engaged research impact. Programmes that support researchers, publics, user communities and/or other stakeholders in developing, sharing and/or practising attributes, skills and competencies in generating and systematically collecting evidence of engaged research impact. Activities that assess quality and promote critical reflection through effective evaluation of activities, programmes, resources, etc. Activities that promote the active sharing of lessons garnered from evaluating the impacts from engaged research. Funds available: Awards will range from £250 – £4,000. Applications to this call are now open. Completed forms should be submitted electronically to Fiona McKerlie in the Research, Scholarship and Quality Unit. Closing date for applications: 14th March 2014 at 5pm. Late applications will not be accepted. We will only accept applications that are made on the online form. Dr Richard Holliman, Chair of the Review Panel. Fiona McKerlie, Secretary to the Review Panel. Fairness in knowing: How should we engage with the sciences?